Olivea and The Screening Room Team Up For Dinner and a Movie! 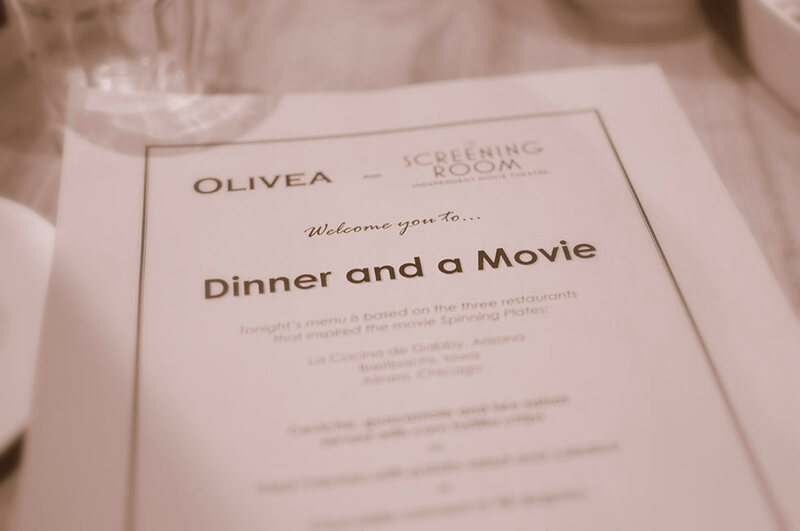 Olivea and the Screening Room have teamed up to offer an immersive pairing experience – Dinner and a Movie. I attended the most recent event based on the documentary Spinning Plates. Chef Stev George created a three course meal representing each of the three restaurants featured in Spinning Plates. First up was a Mexican appetizer based on La Cocina de Gabby – a small family restaurant in Arizona. Chef Stev served a fresh ceviche (a seafood dish cured in lemon juice), guacamole, beans and fresh pico de gallo. Not being a huge seafood fan I was apprehensive of the ceviche. I was pleasantly surprised that the fish was not overpowering and the fresh flavours came together nicely. The appetizer was served family style which gave us an excuse to get to know our fellow food enthusiasts. Chef Stev George at Olivea served ceviche, pico de gallo, guacamole and beans with tortilla chips inspired by the restaurant La Cocina de Gabby. The main course of fried chicken was inspired by the restaurant Breitbach’s Country Dining in Iowa. The chicken was served alongside potato salad and purple coleslaw. The fried chicken was crispy on the outside and tender on the inside. The sides in this dish really shone through as well – the potato salad had hints of grainy mustard and radish which made it really flavourful. I also finished every last bite of the purple coleslaw. Olivea will not leave you hungry – the wait staff offered up plenty of extra fried chicken to anyone who hadn’t got their fix. Everyone at our table was very well satiated by the end of the main course. The dessert – my personal favourite – was inspired by the three-star Michelin rated (read: really fancy) restaurant Alinea in Chicago. Being an expert in the ultra-modern, Alinea is a far cry from the other restaurants featured in Spinning Plates. Chef Stev George stepped up to the plate for the challenge and created a piece of chocolate warmed to 98 degrees on a dehydrated chocolate mousse chip. The chocolate was served with a fabulous homemade ice cream. The dish was topped off with an earl grey and fig sauce. After the generous servings at dinner we were all looking forward to the short, albeit slow and ambling, walk over to the Screening Room to watch the featured film – Spinning Plates. My usual routine at the Screening Room is to load up on their freshly-popped popcorn, gourmet chocolate and specialty tea, however this time I was too full from dinner! The film explored the similarities between the three very different restaurants. Though the restaurants varied in success and style all of the owners overcame struggles for their love of cooking and making people happy through food – a feeling I can relate to! 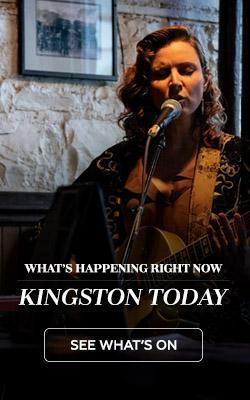 The next Dinner and a Movie is coming up on April 24th featuring the film The Lunchbox. I’m looking forward to seeing Chef Stev’s take on a three-course Indian meal for the next event! Tickets can be purchased at Olivea.